Those of you of a certain age probably remember the ubiquitous cable TV ads of Matthew Lesko, running around DC like a crazed Riddler impersonator yelling about how you can get free money from the government with his book. This is his car. Really. Matthew Lesko lives in the DC suburbs. His son was in my high school class in the late 90s. Matthew Lesko often goes about his daily business in a Riddler suit like he wears in the commercials, and he’s driven a succession of question mark-adorned vehicles. When I was in high school, he drove a red bubble shaped Dodge Caravan with rainbow colored question marks on it. His son drove what I believe was his previous car from before he got into the Riddler schtick, a black 1st generation Acura Legend with yellow polka dot decals on it. At some point he crashed it and had it cheaply painted yellow, with the decals used as stencils and then removed to leave black painted polka dots. When I was in college, one year my summer job was selling cars at a local Toyota dealer, and of course one day in walked Matthew Lesko looking to check out a Scion xB that he could cover in question marks. 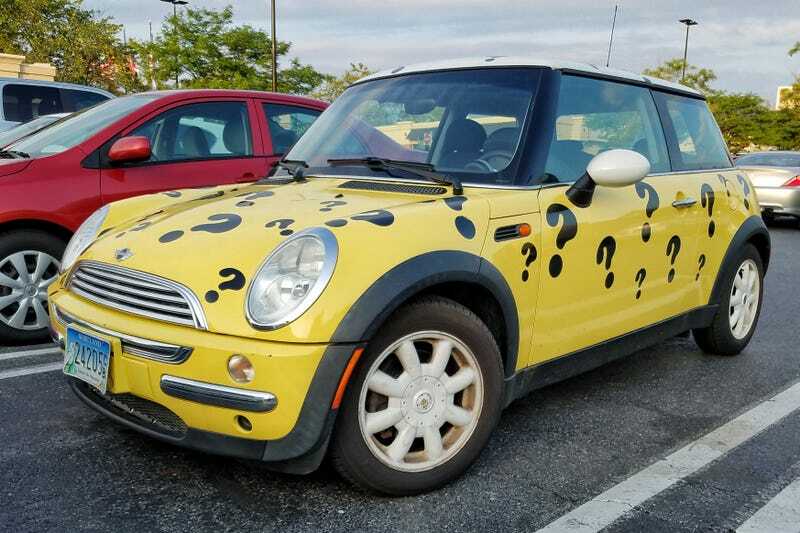 Anyway, now that I’m back living in the same part of the DC suburbs where I grew up, it was inevitable that at some point I’d come across Matthew Lesko and/or his car. Last night, it was parked at the same shopping center as my gym. Bonus round: on my way out of the gym, this Ford Flex with a bunch of Star Wars window decals was outside.